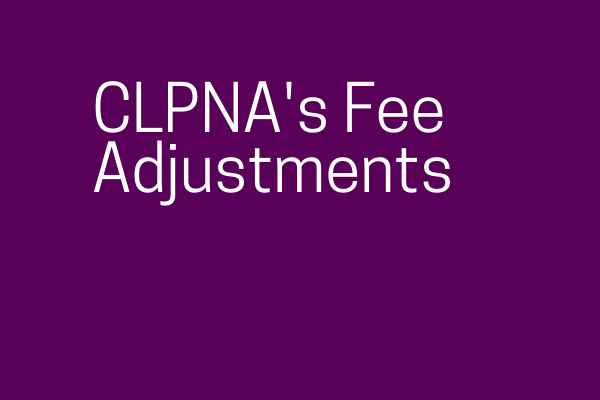 A variety of fee changes were approved by the Council of the College of Licensed Practical Nurses of Alberta starting July 1, 2019. Adjustments include general and specialty application fees, and a new registration levy. There was no change made to annual Registration Renewal fees paid by December 1. The Specialty Application Fee is a one-time fee for those applying after July 1, 2019 to receive authorization for an LPN Specialization. Members who already hold a specialization will not be impacted by this fee. Questions? Contact the CLPNA at Ask CLPNA, info@clpna.com, 780-484-8886 or 1-800-661-5877 (toll free in Alberta).